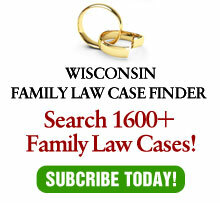 The Wisconsin Supreme Court made its first venture into the complicated issue of the statute of limitations for pursuing child support arrears on May 30, when it decided State v. Hamilton, 2003 WI 50. In Hamilton, the court interpreted Wis. Stat. §893.40, which requires that an independent action to collect child support be brought within 20 years of the date the judgment is entered. The complications in this area arise from several factors. First, most child support orders, including the one in Hamilton, are modified after the initial order, sometimes several times. Second, the legislature enacted Wis. Stat. §893.40 in 1980, which splits during the period of time in which Mr. Hamilton was accruing arrears. Thus, the holding is limited to only those arrears which accrued after 1980. Third, there is more than one way to collect child support arrears. The court expressly limited its holding to independent actions to collect arrears. Therefore, it is unclear what statute of limitation – if any – would apply to a contempt motion within the context of the original divorce or paternity action. In Hamilton, the husband/payor was under a child support obligation since his divorce in 1970. The last court order modifying the order was in 1977. The youngest child reached the age of majority in 1985. No action was taken since 1977 to collect arrears until the state brought one in 2000. The Dane County Circuit Court, Judge Gerald C. Nichol presiding, found that it had jurisdiction to set arrears, although it expunged interest due to the state’s delay in seeking enforcement. The District IV Court of Appeals reversed, holding the enactment of Wis. Stat. §893.40 in 1980 applied to independent actions for arrears to arising after the effective date of the statute. The supreme court affirmed. “We see no instance in which the time to bring an independent collection action after a child reaches majority will be less than one year.” (Emphasis in original. Sl. Op. p. 21). However, the court noted that if it’s application of Wis. Stat. §893.40 would lead to undesired results, the legislature could correct the situation. What is the practical effect of this holding? Probably, very little. First, 20 years is a long time. Few child support orders simply sit without modification for that long. More often, modification proceedings cause the 20 year time period to start anew. Second, most actions to collect arrears are brought either before the child support order terminates or shortly afterwards. Where collection would be difficult, the payee might choose to wait until the order terminates and thus calculate the arrears and interest one time, rather than multiple times. As the court noted, in the most extreme case where the order was set at the child’s birth and not modified, the payee will have at least one year to bring an independent action. Finally, the court specifically exempted its holding from actions within the original action, rather than independent actions. This leads to the inquiry of why independent actions would be used. On one hand, a contempt action has the disadvantage of requiring personal service, but if service by publication is really necessary it seems doubtful that the arrears are highly collectible in any event. On the other hand, contempt actions have the distinct advantage of having incarceration available as sanction if the defaulting party fails to purge the contempt. Few enforcement mechanisms are as convincing as the realistic threat of being an involuntary guest of the government. Therefore, it is assumed that the Hamilton case will not directly affect many cases where there are substantial child support arrears. Where the payor has disappeared many years ago, the statute of limitations is meaningless, as there is no one to collect from. Where the arrears are collectible, 20 years is plenty of time to initiate an independent action. And, if all else fails, an action within the original action can be tried – at least until an appellate court rules on the statute of limitations applicable to that event.